You’d be surprised what a tiny yet trendy clutch can do to any outfit that you are wearing. Pair it correctly and it can jazz up a boring outfit in a matter of seconds. From on-trend looks to no-fail fashion buys to street-style inspo, our list of cool clutch labels in the city will make your everyday chic without burning a hole in your pocket. With a tagline that says, ‘life isn’t perfect but your clutch can be’, Orange Saco’s uber cool range will make your life seem perfect one clutch at a time. There is something to suit every taste, be it festive Dhakai or funky motifs, black & white or gold on gold, zardosi mirror work or denim patchwork. We love their white and gold clutch with an embroidered hand-pulled rickshaw that’s so Calcutta! Super chic, colourful, high-fashion clutches, handbags and evening purses for those (as the name correctly suggests) who know how to flaunt it. The collection will take you on a journey across our beautiful country with their use of Indian textiles and techniques. We adore their hand sewn pearl bucket bag with pretty butterfly and honeycomb detailing. What’s more? They are coming up with their first store in Kolkata very soon (watch this space). Twinkling sequins, Japanese bugle beads, freshwater baroque pearls or glistening gold tassles - Love To Bag’s collection is the stuff that dreams are made of. Let their bags take you to places far away as art, architecture, culture and stunning landscapes find expression in their designs. We are crushing over their latest Iris and Insieme range with rich colours and gorgeous zardosi and beads embroidery. Get your funk on with Adorne’s stylish range that will instantly amp up any outfit. Picture these: hand-embroidered streetlights, aeroplanes, kites, cars, spectacles, mustache and butterflies. They have clutches in wooden, acrylic, plastic and rexin. 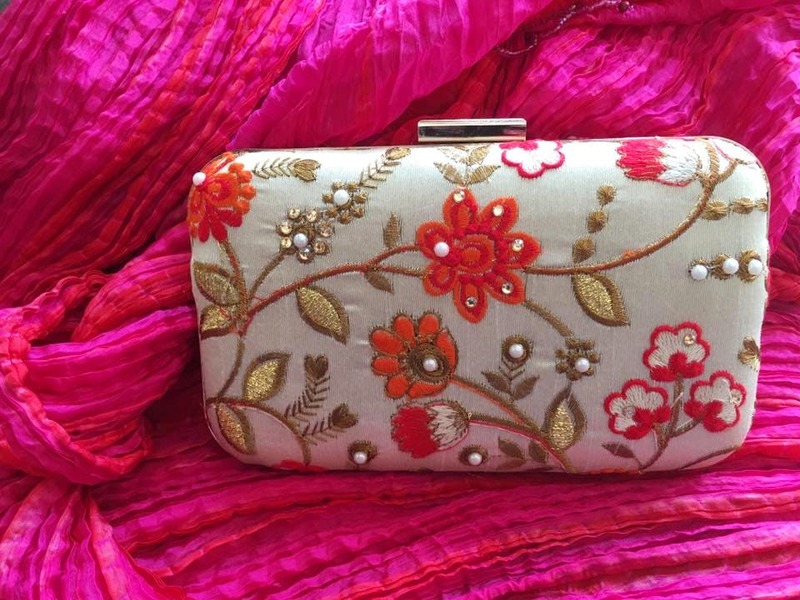 Pick them up in dupian, raw silk, art silk, glittery or matte – you are sure to find bags for every occasion whether it’s the Big Fat Indian Wedding or a casual Sunday brunch with your girls. Krimson’s range of clutches is awe-inspiringly varied and stylish. From metal to wood to fabric to leather and acrylic - with zari, zardosi, beads, thread work, sequins, gota, appliqué and paintwork (phew!) Whatever shape you desire it in - rectangle, square, oval, round and hexagon, We can’t get enough of the double sided wooden clutch and the mother of pearl mop clutch. If you love your clutches in bright tones like blood red, fuschia pink, parrot green or magenta with big Mughal motifs then head over to Chemb. This boutique has casual and festive clutches in all kinds of shapes and sizes, with embroidery, stones, leather patterns and shells. Using silk, satin, velvet and shimmer materials, Chemb’s bags have a very pronounced festive feel to it. You must check out the ones with the gold and silver zari, jaali work.